The Properties dialog allows a user to view and modify the metadata of one or more audio files. To open the Properties dialog, select one or more tracks (e.g. in a playlist), right-click, choose "Properties" from the context menu. To commit any edits you've made to file tags, click either the OK button (to close the dialog) or the Apply button (to save then continue viewing/editing). All fields shown on the Metadata tab can be edited, either individually or by selecting more than one. Clicking a field in the "Value" column will allow the user to make in-place changes, whereas double-clicking a field in the "Name" column will open the "Edit Value" dialog box. For individual files, the "Edit Value" box will only show the field name and the field value; for multiple files, "Single value" and "Individual values" tabs will be available. Although only 13 standard fields are enabled by default – with non-standard field names being shown in an unformatted state, e.g. <GROUPING> – additional "standard" fields can be added under the Advanced preferences page. The Details tab is read-only, and is only used for showing metadata that has been generated by other means. Information on the selected files, such as file path, file size and modify date. Information specific to the audio format/codec/tool that the file has been encoded with. 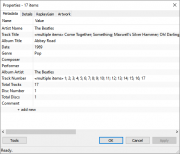 Track and album ReplayGain values. 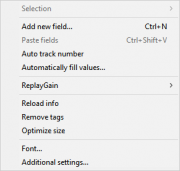 Should manual editing of these values be required, right-click the files in the main foobar2000 window and select "ReplayGain → Edit ReplayGain information". Displays playback information recorded by the Playback Statistics component. The standard Tools menu, without the "Load complete info" option visible. Same as right-click menu commands for the currently-selected metadata fields. Adds a new metadata field with any name that you specify. See copy and paste functionality section below. Automatically fills Track Number and Total Tracks fields, according to original order of tracks that you've opened the Properties dialog for. Tracks placed in different folders are assumed to be separate albums and are counted separately. Fully loads all metadata fields when the "Partial info shown" warning is visible. Reloads displayed information from your files. Any unsaved edits that you've made will be lost. For file formats that support optional tags such as ID3 or APE, those optional tags are completely stripped. Any metadata or ReplayGain information is removed from the files. Select the font, font style and font size for the Properties dialog. "Partial info shown [?]" message. Note: The "partial info" function was introduced in foobar2000 v1.3. 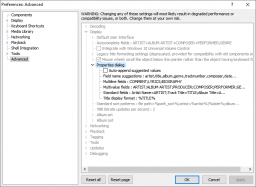 In certain situations, the Properties dialog shows only partial information about the selected tracks; fields considered too long to be cached by foobar2000 are replaced with a . (dot) character and "Partial info shown [?]" is displayed next to the Tools button. This is done for performance reasons, when loading complete info would make the Properties dialog take a long time to open. When partial info is shown, any changes made to the affected fields will not be written to the file. In order to get complete properties dialog functionality, i.e. to view or edit the affected fields, click the Tools button (see above) and select Load complete info. 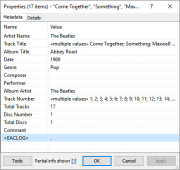 You can transfer metadata values between different fields (e.g.. copy track titles to comments), between different tracks or even between different sets of tracks using copy / paste functionality of the Properties dialog. Simply select one or more metadata fields that you want to operate on, right-click them and choose one of copy / paste commands. The difference between "Paste" and "Paste Fields" commands is that "Paste" replaces currently selected fields' values with field values currently present in Windows Clipboard - regardless of names of fields that you copied before; "Paste Fields" behavior doesn't depend on current selection - it creates new fields with names and values present in Windows Clipboard - if fields with matching names already exist, they're overwritten. For an example: if you copy the "title" field, you can use the "Paste" command to put titles in the "comment" field, but the "Paste Fields" will always overwrite contents of the "title" field with copied values. 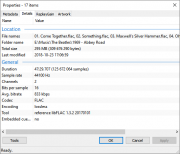 "Paste Fields" is mainly intended for transferring full sets of metadata between different tracks. You can open the Properties dialog for multiple tracks - by selecting a group of tracks in a playlist then choosing "Properties" from the context menu for an example. This lets you mass-edit tags of multiple tracks at once. Various tag manipulation commands can be accessed by selecting one or more metadata fields then right-clicking the selection. When editing tags of multiple tracks, double-clicking a field name - or choosing "Edit" from field's right-click menu - opens a dialog where you can see and edit each track's individual values of that field. You can also select multiple fields then use the "Edit" command to open a dialog where you can conveniently edit individual per-track values of each of those fields. If you wish to go straight to the properties tab when opening the dialog - without additional clicking - you can hold shift while opening the dialog. This also applies to opening the dialog through keyboard shortcuts - if shift is a part of the keyboard combo used, the properties tab will be activated. The following options can be changed through the Advanced preferences page. Specify how many track to pre-load metadata for. The default is "100". Specify which fields can contain line breaks. Specify which fields can contain multiple values (which are separated with a ; semicolon). Specify the "standard" fields visible in the "Properties" dialog in the "Name=Field" format, e.g. Artist Name=ARTIST. Each pairing must be separated by a semicolon. This page was last modified on 22 October 2018, at 18:54. This page has been accessed 397,515 times.